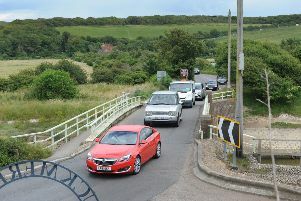 An accident is causing congestion on the A259 in Sussex this morning (Thursday, October 11). The road is partially blocked with slow traffic due to the collision on the A259 South Coast Road both ways at Telscombe Cliffs Way. Elsewhere in the county there is queueing traffic on the A259 Brighton Road both ways from A2025 South Street to Western Road. And in the west of the county there is congestion on the A27 Sompting Bypass both ways from A24 Warren Road (Grove Lodge Roundabout) to Gainsborough Avenue. There are delays due to slow traffic on the A24 Warren Road both ways from A27 Crockhurst Hill (Offington Corner) to A27 Grove Lodge Roundabout (Grove Lodge Roundabout). And on the A27 there is queueing traffic on the Fishbourne Roundabout both ways from A285 (Portfield Roundabout) to A259 (Fishbourne Roundabout).